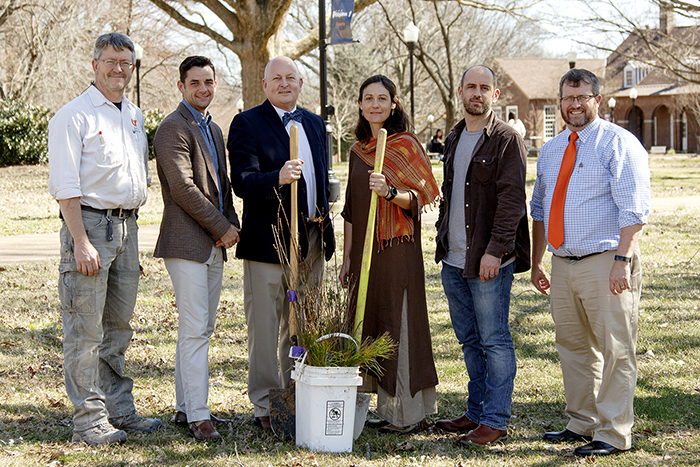 MARTIN, Tenn. – PLANTING TREES – The University of Tennessee at Martin participated in 250K Tree Day on Feb. 27. This event is the Tennessee Environmental Council’s fourth-annual statewide tree-planting event and has grown from 50,000 trees in 2015 to become the largest tree-planting event in the nation. Dr. Keith Carver, university chancellor, helped plant one of 100 new trees designated for the UT Martin campus. More than 1,000 trees have been distributed throughout Weakley County. Local tree-planting efforts were coordinated by the Northwest Tennessee Local Food Network. Pictured (l-r) are Chris Virgin, head of UT Martin greenhouse and grounds services; Jake Bynum, mayor of Weakley County; Carver; Ashley Kite-Rowland, Northwest Tennessee Local Food Network; Dr. Joaquin Goyret, associate professor of biology; and Dr. Todd Winters, dean of the UT Martin College of Agriculture and Applied Sciences.